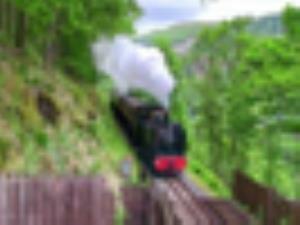 Make the most of the long summer evenings with a steam hauled evening excursion along the Rheidol Valley. There will be no need to worry about cooking as we'll serve up a delicious fish & chip supper at Devil's Bridge! Summer Evening Excursions depart Aberystwyth at 6:00pm, arriving back at 9:00pm. Menu choices: Fish & Chips, Vegetable Curry with Chips or Rice, Sausage & Chips. Standard ticket prices apply + Meal price.